Mmmm...I love rice. But it can get boring and repetitive at times; that's why I always look for ways to spice up. I was excited and encouraged to find a recipe for wild rice with dried fruit and nuts in the latest Martha Stewart Everyday Food magazine. It called for a combination of pecans, scallions, raisins or craisins. The recipe was more involved than just throwing all of these ingredients together, as it also incorporated using red wine vinegar as soaking liquid for the craisins. Wow! It made them really tart and caused a couple of eyebrow raises (in a good way). Since I doubled the portion for a family dinner, I had plenty of leftovers that were delicious alongside beef, chicken, turkey or even on its own for those of you who are veggies. You can surely substitute other flavors such as golden raisins or even little pieces of bacon. Let the rice be your palette and just go nuts. Separate the white and green parts of the scallion. In a medium saucepan, heat the olive oil over medium-high. Add scallion whites and cook, stirring often, until soft, 3 minutes. Season with coarse salt and ground pepper. Add the wild rice and cook according to package instructions. 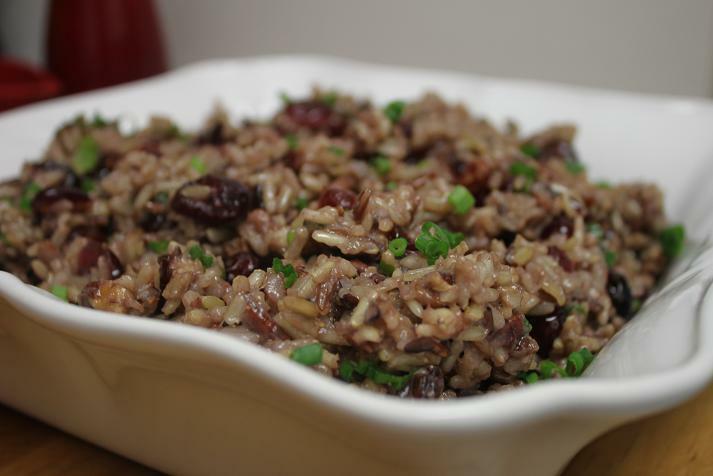 Meanwhile, in a small saucepan, combine the red-wine vinegar, dried cherries or craisins and 2 tbs of water. Bring to a boil over medium-high. Reduce to a simmer and cook until vinegar is almost absorbed, 3 minutes. 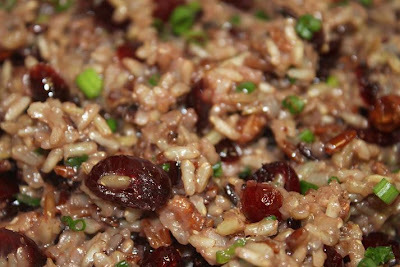 Transfer to a bowl and add rice mixture, scallion greens and pecans, toasted and chopped. Stir well to combine and season to taste with salt and pepper. Serve warm or at room temperature.